When I started as a food blogger, I had NO IDEA how much food photography was going to be part of my life. I had imagined, rather naively, that I could just take a quick snap of my dinner (in the dark, with the lights on, using the built in flash), upload it to my blog (with zero editing), and that would be that! It didn’t take me long to realise that food photography is a HUGELY important part of food blogging and that I seriously needed to up my game. And since those rather shaky beginnings I have learnt A LOT. In fact, I learnt so much in my first year that I turned it into a blog post: 10 Things I’ve learnt about Food Photography from my First Year of Blogging. I have really worked on my photography, by attending courses and scouring the internet for food photography tips, but probably the most helpful thing I have done is read food photography books. 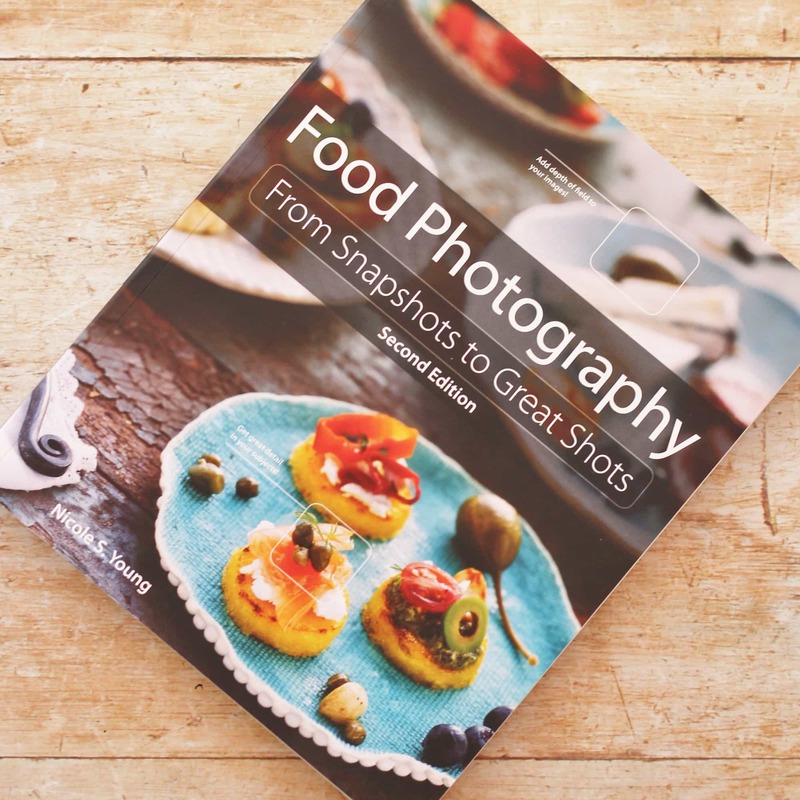 My favourite two by far have been From Plate to Pixel by Helene Dujardin, and this one I’m sharing with you today: Food Photography – From Snapshots to Great Shots by Nicole S. Young. Plus, because I love you all so much, I am hosting a GIVEAWAY to WIN a copy of this fab book! Find out how to enter at the bottom of this review. Who is Food Photography – From Snapshots to Great Shots by? The book is written by Nicole S. Young – a full time photographer specialising in travel, landscape and photography. She also has a fab blog full of great photography tips. What is Food Photography – From Snapshots to Great Shots all about? 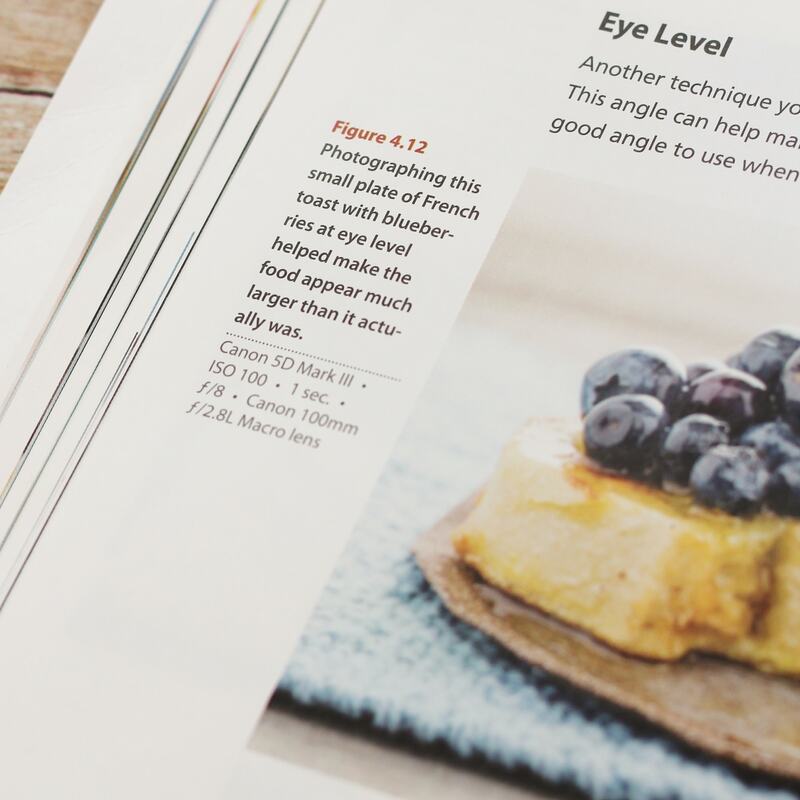 This book is very comprehensive – it starts with the basics of food photography: from choosing a camera, lens and other equipment, to taking a photograph in manual mode and getting the exposure right. She also shares her advice on lighting, food styling, composing a great shot and sharing photos on your blog and social media. There is a whole section dedicated to each of these areas. The book has a really comprehensive section on using Adobe Lightroom. I don’t yet use Lightroom, but if and when I do, I will be coming straight to this book for tips! She shares everything from getting started with Lightroom, to organising your photos in lightroom, editing and exporting files. And, although I don’t use Lightroom, I still found quite a lot of her advice about organising and editing files really useful. My favourite section, though, is her last chapter, which is called ‘Behind the Scenes’. In this section, Nicole shares exactly how she approaches a photo shoot from start to finish. It goes from her initial brief, through choosing props and styling, to lighting setup, actually taking the photograph and finally editing in Lightroom. I cannot state enough how valuable it is to see how a professional photographer approaches a photo shoot – and there are also loads of behind the scenes photos, which are fascinating and super useful! Are there any special features? Yes, at the end of each chapter Nicole sets a series of challenges related to the material you have just read. If you are the sort of person who likes putting what you have just learnt into practice, then this is perfect. It is also a great way of getting your head around the key points of the chapter. An example of one of Nicole’s challenges would be at the end of Chapter 3 – Styling and Props, where she challenges her readers to ‘make it messy’ – adding crumbs, drips, berries or seeds to a picture to make it all a bit more messy. Those who follow my blog will know I’ve been working hard on this challenge!! Who is Food Photography – From Snapshots to Great Shots for? This book is a great book for anyone who needs to take photographs of food. It is not written specifically for Food Bloggers, but food bloggers will benefit enormously from the book. It would also be useful for anyone who needs to take photos of food for another purpose – for example if you own a restaurant or another type of food business and need to take shots for social media or promotion, or just if you love taking snaps of your food for fun – or to share on your social media accounts, but want to take really good ones! It is pretty much geared towards people with DSLR cameras, so if you are not looking to invest in anything more than a basic compact camera, or your phone, then this might not be the book for you. It definitely assumes you are reasonably serious about getting better at food photography and want to spend a bit of time and money on it. Are there any negative aspects of this book? Not really, though as I mention above, it is best suited to those with DSLR cameras or those who are looking to buy a DSLR camera in the near future. It is quite technical, but don’t let that put you off! When I first read the book, about a year ago (when I was looking to buy my first DSLR camera ), A LOT of this book went straight over my head. I recently re-read the whole thing from cover to cover, taking notes, and so much more of the book made sense, and consequently I got a lot more out of it. I imagine if I re-read this book again in a year’s time I will get even more out of it. I will definitely be re-reading the Lightroom chapter when I finally get round to using Lightroom! I suppose the only other negative is that this book is not specifically written for food bloggers and therefore some of the advice is not really practical for the constraints that many food bloggers work under (very little time, small children getting in your shot, no dedicated workspace etc. ), but that is only a very small negative. With an ounce of common sense you can work out how to adapt the advice from the book to your own situation. 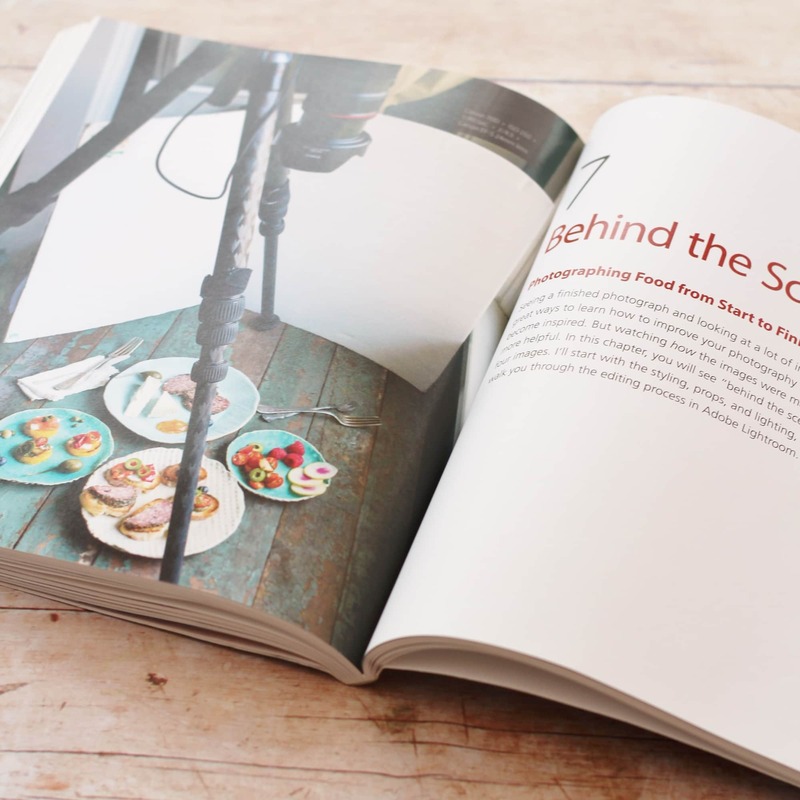 What are the best food photography tips from the book? I have learnt so much from this book since I bought it over a year ago, so I thought it only fair I shared just a few tips I have learnt along the way together with a few examples of where I have used that advice in my photos on Easy Peasy Foodie. This book sounds great! How can I get my hands on a copy? Haha – funny you should ask. 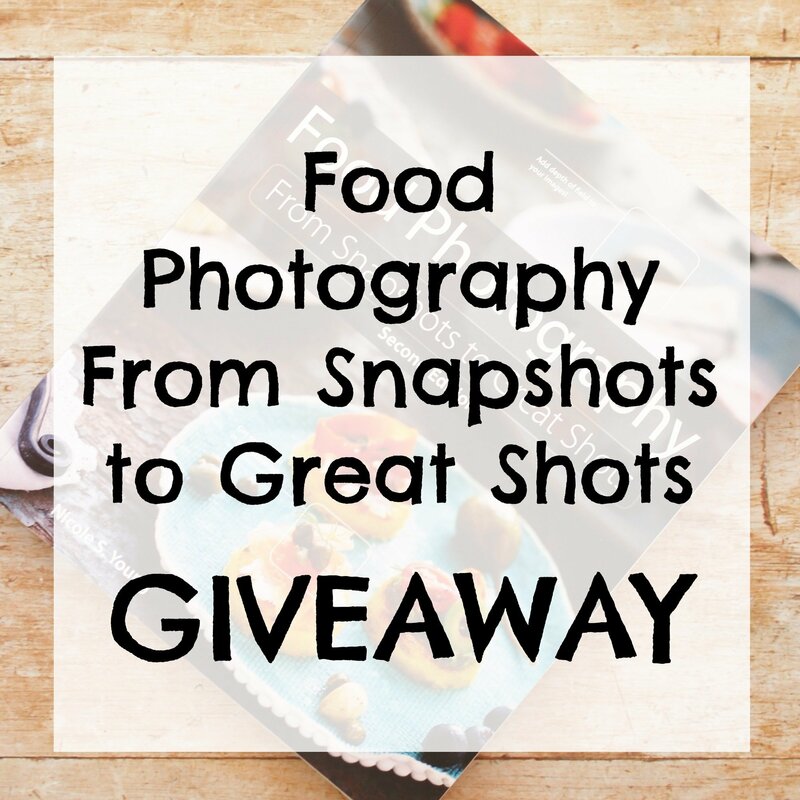 You can either buy a copy of Food Photography – From Snapshots to Great Shots on Amazon OR you can WIN a free copy in my GIVEAWAY! Help! I’ve never used Rafflecopter before…what do I do? Rafflecopter is a little widget that allows me to run a kind of raffle on my website, except instead of entering by buying a raffle ticket, you enter by doing things such as commenting, following me on Twitter and visiting my Facebook page. For one entry, all you have to do is answer this simple question: What is the best food photography tip you’ve ever been given? Then for a further entry, simply visit my Facebook page. And don’t forget to complete the Rafflecopter widget to say you’ve done these things or they won’t count! Once you’ve done this, the Rafflecopter will unlock all the other ways you can enter, but don’t worry – you don’t have to do them all (though I’ll love you forever if you do 😀 and remember, the more entries you make, the more chance you have of winning!) When the competition closes, the little widget will work its magic and select a winning name at random. I will then contact the winner via email to arrange for the book to be sent to you. If you have any trouble at all, please ask via the comments below and I will do my best to help you. Good luck! Try taking photos from multiple angles. Some foods like pizza look better from above, whereas foods like burgers look better from the side. Try moving around the plate and taking photos at various angles so you can pick your favorite later. I haven’t got this book, and it seems like a great addition to my collection. I’d love to win it 🙂 Best tip? OK, let’s go for the craziest. Rather than getting steam everywhere when shooting hot soup, shoot it cold but to get some steam, dip a tampon in boiling water and hide it behind the plate. Bit weird, but it works! I remember the tampon tip at the Foodies100 River Cottage event- still not tried it but I will be looking at your pics with interest from now on! Take a variety of photographs of the same subject. Vary distance, angle etc. I found that some photographs were more interesting when they were taken close-up. I have the book and have started to read it. Its a good one I think but agree that some of the terminology is a bit technical, so far i have only read the basics at the beginning which i kind of know but want to check im not missing anything and i can just about follow, not sure i could if I had no knowledge. So I can see why you are gaining more from re reading. I partly got it because I do have and use lightroom (I have installed programme not the cloud version) and I am sure that there is more I can do with the programme. Your pics have come on so much I admire how far you have come – I at least started with years of experience as a food stylist so have only had to get to grips with the camera and editing which is hard enough. Interesting what you have said about getting messy. I remember when messy plates, first became fashionable. Its a hard look to master as there is a fine line between it looking good and it well…. looking a mess. You are doing so well. I take my hat off to you. My best tip is to never use the camera flash. I was once told to spray the food with water, especially if it is fruit. Look for interesting angles, shapes, patterns and colours. Love looking back and seeing how much better photos have got! I do love your photos Eb they are lovely! I think the wallpaper sample for backgrounds and making your own wooden boards is a great tip I read somewhere! When it comes to photography I am not really good, I just know that light is important more than anything else, more than the camera even! I stumbled upon this tip on one of the food blogs, cannot think of the name now! I need this book and I need lightroom! Despite positive feedback, I always think my food photos are crap…….. My problem is definitely the technical understanding. Light always seems to be my nemesis. Oh….. and time is never on my side either! Tips? Simply to use natural light and to bounce it back with a piece of white card. Try to arrange or angle your food so that there is a shine on it to make it look mouthwatering. I think the best tip I’ve had is to take away the last thing you’ve added to the photo! I feel into the adding more trap and realise that when I take away the last prop or item then I am happy with the shot. My photography has come on a lot in the last 2 years. I’d love to go back and retake the photos, but then again its nice to see how far i’ve come! I NEED this book in my life Eb, I love my new camera and I think my pics have improved imeasurably since my early blogging days too but I know that I have sooooo much to learn too. I think one thing I have certainly learnt is that I often get camera shake. I try to counter that either by using a tripod or (if I can’t get it in the right position for what I’m trying to capture) I might rest the camera on a multi pack of tinned beans (more stable than a single tin) or even a robust box (which often provides me with three different height to work from). I also find that although I position the shoot by the kitchen window that I’ll take a sequence of shots from the same position and there will be one that will sometimes have a caught a moment when the sunlight is landing on the food so much more nicely than the others in the sequence (that’s once the clouds have shifted!). So I think I think taking a sequence of shots helps the potential of capturing the light just right. I think using nail varnish (clear) as a glaze! This looks like a great book! In don’t really have any tips…… try to get height in the food before taking pics…… Sorry I’ve not got much knowledge! I just point and shoot ? That probably explains my pictures! I’d love to know how to photograph food, my pictures always look flat. Around lighting and how it bounces. Don’t do it when you want to eat it! This is usually my problem! Sounds a great read. I like the advice for taking from as many angles as you can, my best photos have been from angles I didn’t think would work. Your photography is going from strength to strength Eb, I love your messy pancake shot. The best tip I learnt was to have some idea of what you want from the photo before you begin, make a rough sketch and have plenty of extra props just in case. Eb, your photos are inspiring in themselves, let alone the advice. I think your comment about buying the best you can afford is great and the recognition that starting out you’re going to have (or only be able to afford) something basic and making the most of it. I can see that you have improved massively, but what is clear is that you had the skill, they ‘eye’ (whatever it’s called) to start off with as your early shorts are definitely better than others – including my own – early photos! I think my photography has come on a lot itself, but I’ve ruined many a chance of getting my recipes out there by my rubbish photography and your tips have helped. This book would get a lot of use in my house! I think the tip I have used the most from early stages is to avoid artificial light. Difficult in northern Europe in the winter, and especially as I work and am out of the house during winter daylight hours. To compensate someone told me to take my food outdoors and photograph it outside if I have to turn the lights on indoors. The light quality is better, it’s more diffused, there’s less reflection and the camera copes with the scene better. I love photography this would be a new string ! What a fantastic post and honest review of this book. I’m looking to buy a camera, so far all the shots on my blog are iPhone or iPad. In fact for the first year I ran my entire blog from my iPhone 4S. My top tip is always use natural light and again try different angles. I’ve actually found the photography side of being a food blogger really enjoyable, however I still have absolutely masses to learn. Look for interesting angles and try to use natural light. The best tip I was ever given was to let myself indulge in it! People can be very disparaging about people taking photos of their food, but studies show people who do actually enjoy the taste more! Use some nice props to enhance your shots. Pretty plates, glasses, tablecloths and antique cutlery can add a nice feel. You can get unusual things in markets and antique shops. It does not have to be expensive. One of the nicest glasses I saw in a photo was from a pound shop. To use plain plates, no crazy patterns just plain white so they don’t detract from the food. Use natural light, whenever possible. ensure you are familiar with your camera functions before you start! Choose the plate colour carefully so that it compliments the food on it! Photograph the food while its still hot. It looks more appetising. My pics are no where near as good as yours but I too can see an improvement since doing a couple of blogger workshops. I now look for fabric remnants and kitchenalia in charity shops – in fact it is a perfect excuse to buy retro kitchen stuff. I have loads I haven’t used yet! I can’t get the hang of flat lays and don’t think I have an eye for them so I would say to people not to worry if they can’t follow the crowd – go and find a new angle that suits you! This book is definitely on my wish list! I’ve been playing around with angles and I’ve learned how importaht lighting is when taking my food shots in particular. Best tip was for bowls… Using tin foil or aluminium foil underneath the food to help make it shine especially for side dishes or condiments! Best tip for me had been to look at the lighting and be aware of the shadows, even when you’re using natural light rather than artificial. My absolute favourite tip is to use mash potato instead of ice cream! Basically consider the impact of time and heat on the food you’re photographing, and see if there’s any realistic alternatives you can use instead. Use a fairly neutral background which allows you to place maximum emphasis on the food in the scene. A neutral background doesn’t mean that it has to be completely plain, but it should complement the subject rather than suppress it. I need this book! Can it also conjure up natural light for me when the weather us being exceptionally British!!! The angles you shoot from are so important, and natural light where possible. Check what you can see in the background! using natural light if possible is the best tip i try to remember. I also think a few props really help whereas before i used to only photograph the food and nothing else around it. Take a variety of shots as you never know what will jump out as the perfect shot. Experiment with angles and don’t be afraid to cut off corners if necessary. Don’t use the flash because it can make food look a bit raw!